The Wizarding world's creator – J.K. Rowling – appears to have a fascination with all things legal. She wove into her incredibly captivating story many vignettes that implicate the law. If you think about it, you realize the law had to be an essential component of the series because what J.K. Rowling did was to create an entire new society in an alternate universe. For a society to function orderly and for people to live together without chaos, there must be laws and rules for people to follow. Thus, law is a critical component for any civilized society, including ours and Harry's. Law is what differentiates anarchy from order and civility. Law imposes penalties – such as jail or fines – for illegal acts. Law also provides a mechanism to settle disputes among people and protect our rights as individuals. In the Wizarding world, there is a Ministry of Magic which functions as the government. The Ministry, among other things, establishes and enforces laws through its various departments. This structure in which that government creates and enforces the law is similar to how government functions in the Muggle world. Likewise, many of the laws in Rowling's universe are similar to those in the United States of America. This makes easy the undertaking of this book – to equate laws referenced in the Harry Potter story to the laws that all of us must follow in this country. This book uses the twists and turns in the experiences of our favorite, and some not-so-favorite, characters as case examples to illustrate legal principles. HP Facts. This section contains Harry Potter story sketches relevant to the particular law addressed in the chapter. After each HP Fact, there will be a reference to the applicable Harry Potter book and chapter from which the facts were extracted. Muggle Law. This feature provides easily understood explanations of the law of our (Muggle) society. Application to HP Facts. This part discusses the Muggle law's application to the book's characters and story line. This information eases the learning process by involving plots and characters that fascinate us all. Other Areas of Law Implicated by These Facts. 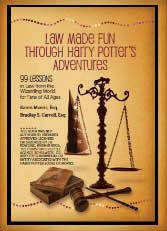 This section will identify other legal topics discussed in this book that apply to the same HP Facts. So come extend your encounters with your Wizarding pals and add an additional dimension to your reading – lessons in law from Harry's adventures.